Whether it is to learn, laugh or be challenged, to share discovery or wonder, art brings people together. And whether by stimulating appreciation or controversy, art helps people understand each other. This sounds straightforward enough, but is it true? Does art really do this and, if so, how? Those were my questions as I set out to write about the Building Bridges Program, which since 2007 has backed arts initiatives in the us through a total of 138 grants, all of them focused on Arab and Islamic cultures. From 2007 through 2017, Building Bridges allocated $20.4 million in grants ranging from about $15,000 to more than $1 million. In many cases, it chose to serve as one among several sources funding a project, creating opportunities for alliances within communities. “One-shot events, one-shot activities, one-shot experiences tend not to be sufficient,” says cultural historian Jack Tchen of the Department of Social and Cultural Analysis at New York University (nyu). Effective educational cultural programs are “always about a process,” and it is important that funders “acknowledge the time and labor, and care that’s needed.” Zeyba Rahman of Building Bridges would agree: “Sustained activity does create measurable impact, but the key word is sustained.” It is a quality Building Bridges looks for in grant applications. Rahman unabashedly aims to “move the needle for people.” The problem, she acknowledges, is that nobody has devised a foolproof way to identify, much less quantify, just what makes us change our mind about others. Researchers can measure changes in people’s intrinsic biases, but they don’t agree on which tools to use. It is also hard to tease out the active ingredients in a program and correlate these to outcomes. Ask anyone who has filled out a grant request. They sigh. They often have more anecdotes than data. They know things in their gut but can’t prove them. So what is it they think they know? How does art change us? I set out to find out by taking a close look at four Building Bridges-supported programs, each centered on a different approach: play, laughter, visual appeal and performance. 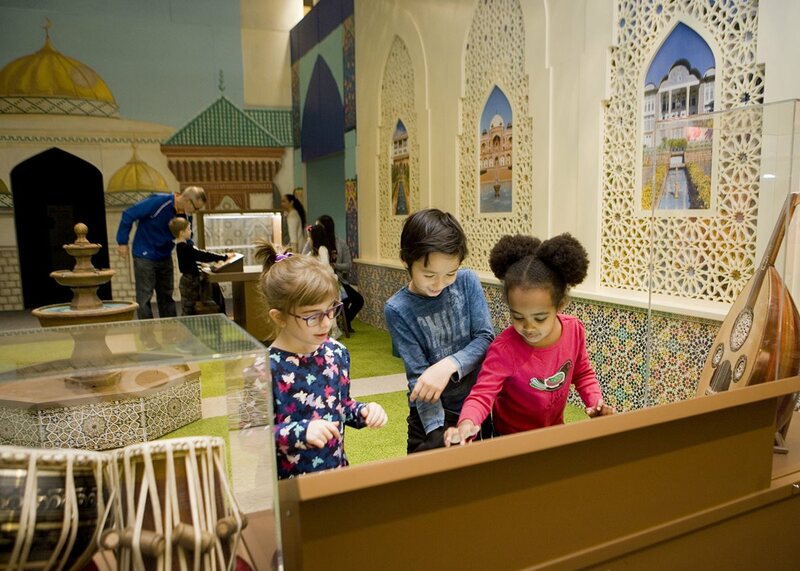 The challenges for Lizzy Martin, director of exhibit development for the Children’s Museum of Manhattan, were to represent a range of cultures that identify with Islam and then engage kids from a range of backgrounds. She and her team started with familiar things—a truck, a boat, a shop. With input from art experts and historians, they “layered on culture.” Voilà—a Pakistani jingle truck, an Omani dhow and an Indonesian fruit stand (complete with smelly durian fruits). Walking into “America to Zanzibar: Muslim Cultures Near and Far” at the Children’s Museum of Manhattan in New York is like stepping into a miniature city. Adults notice its plaza, with a fountain and tilework, its row of colorful market stalls and the prow of a boat that fills a corner of the room. Kids see games, props for dress-up and things to climb. Four-year-old Jonah has been a regular lately. His mom, Micah Spratt, brings him several times a week. Today a long console with pictures of musical instruments catches his attention. As Micah reads the names—“ney, ‘ud (kind of like a guitar, right? ), ebana, ghijak, tabla (looks like drums), kora”—Jonah is figuring out the game. He taps “ney,” and a flute sounds. Taps it again—silence. On. Off. Pretty soon, he’s layering melodies of ney with ‘ud and ghijak, and then tapping the tabla on–off–on–off–on, causing bursts of drumbeat to erupt beneath the melody. Jonah smiles. Then runs off to climb the dhow. Multiculturalism alone, says Tchen, “oftentimes doesn’t do much.” Adults, he explains, need to help children connect new experiences with things or people they already know. Conversations about similarities and differences, he says, are what later enable us to learn to see through stereotypes. The market area, meanwhile, is buzzing. Six-year-old Luke catches and sells fish in Zanzibar. Three-year-old Fallon fusses with a Senegalese cloth on a tailor’s dummy—when she’s created a full skirt, she declares, “Looks like a tutu now.” And four-year-old Kate, in a red dress dotted with cartoon puppies, stands amid a pile of Moroccan throw rugs with zingy patterns. One she dubs “my bed.” Another, “my yoga mat.” Then, plopping down on a purple-and-white one, she wraps her legs in the red, yellow and black stripes of the other. When she leans back, hands behind her head, she forms a new, dazzling pattern. And she, beaming, knows it. Elsewhere, in a dark viewing room, teenagers manipulate the controls of a console to project 3-D images of mosques onto a curved wall. One moment they’re standing inside New York’s modern mosque at 96th Street. Next, they’re gliding, eyes wide, under eighth-century arches in Córdoba, Spain. Native New Yorker Nicolle Newby, on the other hand, sought out the exhibition. While her kids, six-year-old Chance and four-year-old Couture, avidly explore, she follows, taking photos of everything from the Tunisian tiles to home-like settings, decorated with photographs, books and mementos of New York Muslim families. There is also a table where Chance and Couture hunch over tablets learning to say and write “My name is …” in Arabic, Bengali, Hausa and more. “I like taking them to a variety of places,” Newby says, “because if kids don’t get out, then they don’t make friends easily with people from other ethnic groups, backgrounds, skin tones.” They also don’t develop a curiosity about themselves—back home, they pepper her with questions about their own Christian heritage. On the campus of the University of Houston, the internationally renowned “calligrafitti” artist eL Seed climbs onto the platform of a cherry picker, paint can in hand. For several days, this becomes his studio, and the brick wall of the Graduate College of Social Work his canvas. The can rattles as he shakes it, hisses as he sprays. Black lines loop and crisscross. As the hours pass, the spaces in between fill with yellow, turquoise, orange. On the wall, eL Seed is writing an Arabic translation of a quote from the city’s namesake, Texas hero Sam Houston: “Knowledge is the food of genius, and my son, let no opportunity escape you to treasure up knowledge.” Not that anyone can read his highly abstracted calligraffiti. He—and his mural—were welcomed. No criticism. No protests. Whether in conversations or in social-media posts, people seemed excited that a star of the art world created a site-specific work at their university. The Cynthia Woods Mitchell Center for the Arts, which invited eL Seed, staged programs around the mural. Classes discussed it. Andrew Bayliss at the University of East Anglia’s Psychology Department found that when two people are reacting positively to something they are looking at together, they tend to deem the other person “more trustworthy and more pleasant.” Researchers are now exploring whether this “joint attention” phenomenon applies similarly in social media and other virtual spaces. 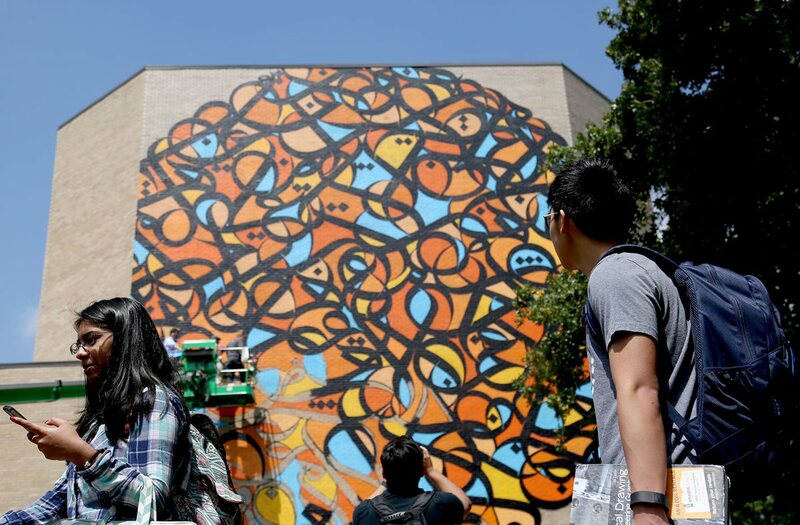 But if organizers expected the mural might provoke contentious conversations, it largely hasn't, says Emran El-Badawi, who heads the university’s Middle Eastern Studies Program. The artwork has, in fact, very quickly blended in on a campus that is so comfortable in its diversity, and that has so much public art, that people, he says, “take this mural and initiative for granted.” Its presence here does not challenge how people see themselves: It confirms it. Yet, having an Arabic mural be no big deal might just be the big deal. It says that Arabic is an accepted part of an ever-growing American fabric. That’s a powerful theme, and El-Badawi says colleagues at other institutions have contacted him to pick his brain as they contemplate similar initiatives. “Halal in the Family” started as a segment on “The Daily Show” and turned into a sitcom web series that challenges stereotypes and misunderstandings through the eyes and foibles of a us Muslim family. It can be found at halalinthefamily.tv or on the “Funny or Die” channel on YouTube. “Halal in the Family” marked a step outside the comfort zone for Building Bridges, says Rahman. But she and her team liked its deeper message and its potential to reach so many people. I log onto halalinthefamily.tv and hit “play,” launching the web-tv comedy series about a fictional Pakistani Muslim family living in a generic white-majority suburb. With four episodes that each runs five to six minutes, it’s a compact immersion that takes aim at religion-based bullying, fear-mongering, stereotyping, profiling … you name it. From all sides. Originally intended to be a Muslim parody of the “The Cosby Show,” it ends up closer to “All in the Family” with the main character, named Qu’osby, as blinkered and cringe-inducing as Archie Bunker ever was—and sometimes worse. The Perception Institute showed 2,344 viewers “Halal in the Family” and an excerpt from a narrative documentary about Islamophobia called “Truth Over Fear.” The institute found the documentary slightly more effective in getting people to question assumptions, but then they looked at how many people each one reached online. The film had attracted 10,000 views, while “Halal in the Family” had racked up 620,000, plus 18,000 Facebook “likes” and 2.5 million posts. In another episode Qu’osby meets his kids’ math teacher, who is white, and played by Jordan Klepper. It’s instant bromance as they bond over a “’68 Mustang fastback with a 302 two-barrel V8” and other memes of Americana. When the teacher mentions he needs to go because he’s heading over to the mosque, Qu’osby discovers his new friend’s name isn’t “Wally” but Waleed. He feels duped, and he jumps to the ridiculous conclusion that Waleed is faking his identity to spy on Qu’osby. This makes Qu’osby react so weirdly that Waleed then suspects him of reporting to the fbi. The scene resolves with them all laughing at the absurdity of thinking they were spying on each other—a shot filmed through binoculars by someone peering from outside the window. Neuroscientist V.S. Ramachandran says laughter evolved from a signal our very distant ancestors used to broadcast that all was okay. Imagine this: A man spots something moving in the shadows. He tenses. A kitten mews. He laughs. Hearing him, the others relax. This is effective, wordless vocal communication. Grace Aneiza Ali, who teaches art and policy at nyu, believes comedy can look at a specific, difficult situation—say, the tension between two immigrant parents and their locally born children—and universalize it so that everyone, laughing, connects with it. Every episode is over the top. Some gags don’t hit my laugh button. But they always make me roll my eyes at the inanity of the prejudices they pillory. “Halal” intends to be funny and activist: Right under the video, the site provides statistics and information about problems Muslims face, along with links to find out more. LaSalle says nobody has tracked yet how many viewers have followed up, but one thing’s certain: the industry has. The series won a Peabody-Facebook Futures of Media Award, and Turner Broadcasting System (tbs) commissioned a pilot script for an animated adaptation. Though tbs did not pick it up, the production team is shopping it around. It won’t be parody or satire, LaSalle says, but a warmer comedy about a Muslim family trying to fit into in a small Arkansas town. If produced, television viewers too might soon be laughing with Muslim neighbors—and sometimes at them—because, after all, the characters are bound to have plenty of blind spots, too. Backed by local musicians, Waayaha Cusub performs at Talahi Community School in St. Cloud, Minnesota. During its Midnimo residency, the group ran 16 college classes, conducted seven workshops and visited four public schools—in addition to performing and appearing on local radio programs. Some 60,000 people of Somali origin live in Minnesota, comprising the most recent of the many groups of immigrants—among them Scandinavians, East Europeans, Asians and Latinos—that have settled the state that was for centuries home to Dakota Sioux and Ojibwa tribes. I head west and north to Minneapolis, where the Cedar-Riverside neighborhood is known—by its residents and outsiders—as “Little Mogadishu.” More emigrés from Somalia live here than in any other single place in the us. Arriving, I look for the marquée of the Cedar Cultural Center across from Al-Karama Mall on Cedar Avenue. For close to 30 years, it has hosted musicians from around the world. More recently, it has also developed into an important meeting point for Somali and non-Somali communities. I also meet four local non-Somali instrumentalists: keyboardist deVon Gray, drummer Joey Van Phillips, bassist Jim Anton and guitarist Jeremy Ylvisaker. The organizers have brought them in to play backup for Waayaha Cusub. On a Thursday morning I join them in a red-brick building on Augsburg’s campus. In a large classroom, the musicians all sit with their backs to the blackboard as students, all music majors, trickle in. Helped by an interpreter, the Somalis introduce themselves. When the class starts, the students are attentive, but there’s no feeling of chemistry. Then Joey taps out a tempo. Shiine motions the class to stand. They’re going to help him sing a song. It doesn’t take long before Waayaha Cusub is calling out verses and students are belting the refrain. The students mangle the Somali lyrics, laugh, and try again. It doesn’t take long before Waayaha Cusub is calling out verses, students are belting the refrain, and everyone is jamming. Back in their seats, conversation now flows. Students speak about music as something they love, study and dissect. Waayaha Cusub members talk about their hip hop as mission: They sing to keep Somali youth from falling prey to militants. Death threats, an assassination attempt, the disorientation of refugee life—nothing has deterred them. The students want to know about the Somali kids Waayaha Cusub reaches; the Somali singers want to hear about the students’ goals as future teachers and musicians. The local Somali community generally likes Midnimo, says Amano Dube, director of the Brian Coyle Community Center. But it is divided over Waayaha Cusub’s anti-militant messages. Some feel these inadvertently reinforce anti-Somali and even anti-Muslim sentiments by implying Somalis are “more susceptible to having children turn bad.” Others, however, believe the frank talk helps steer young people in good directions. By residency’s end the singers have run 16 college classes, conducted seven workshops for youth and worked with pupils at four public schools. In many cases, they see the same audiences for two or three sessions. Then, in a few months, another group of artists will come, and with them new music and new stories. Scientists have confirmed what we have always suspected: Interacting with people who are different from us alters the way we think about them. Researchers term this “intergroup contact,” and study after study has shown that sharing a positive experience reduces prejudice primarily by reducing anxiety and increasing empathy. Each of the projects that Building Bridges supported drew non-Muslims and Muslims alike, and in different ways each offered multiple experiences. I saw art engage people mentally and emotionally, then deliver information, foster camaraderie, engender trust, stimulate curiosity and bolster identity. As time went on, it became like watching a cloth being woven, threads—sometimes similar, sometimes wildly different—crisscrossing to create ever-varying designs. We know from the news that, all around the globe, the need keeps growing. For Building Bridges’ 2018 grants competition, the number of applications doubled, says Rahman. And we now know enough about laughter, mutual attention, play and the evolution of cultures to begin to understand how art programs can make a real difference. “Sometimes,” says Jack Tchen, a cultural historian at the Department of Social and Cultural Analysis at New York University, “we talk about otherness as if it’s a bad thing,” as if the world would be easier if everybody were “like ourselves. And that’s impossible.” What is possible, though, is discovering who others are. Who we are. And what more fun and energizing way than through art which, as Rahman says, leads us to “consider and reconsider our positions” by inviting us to cross a bridge to—let’s go find out.